Spend a morning or afternoon swimming with dolphins in the Atlantic Ocean in Portugal. 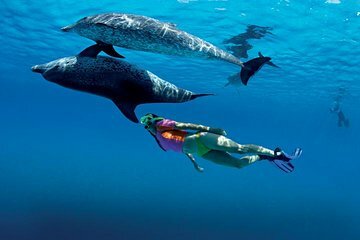 Led by a biologist, learn how to swim safely and respectfully with dolphins in their natural habitat. Float into the ocean on a Zodiac boat and then enter the water with a snorkel and wet-suit to swim alongside the magical creatures. This tour is ideal for animal lovers and anyone looking for a unique experience in Portugal.